Manager and staff were excellent, super helpful and friendly. A lovely little oasis in Siem Reap. The pool has two levels so our 2yr old could stand and play in the pool and the 5yr old could also swim. Good food, good service, very friendly staff. The room was large and well maintained and quiet. A lovely stay and we would definitely come back. It is a pretty impressive place to stay in Asia. It is my second time in Siem Reap and I felt so comfortable and relaxd. The location and the private pool was so good. What an awesome experience to enjoy some historical wonders of Cambodia at Angkor Wat and have wonderful modern amenities at our hotel Empress Residence Resort & Spa! This combination was the perfect setting to get prepared for and to enjoy the temples and rural areas of Angkor Wat and Tonle Sap. 20 minutes Tuk tuk to Angkor Wat and had a great guide there. They did help us with touring Angkor Wat and setting up our airport transfers. We booked excursions to Angkor Wat through the hotel and it all went perfectly. Angkor Wat is located in a historic area of Siem Reap known for its beautiful sunrises and temples. 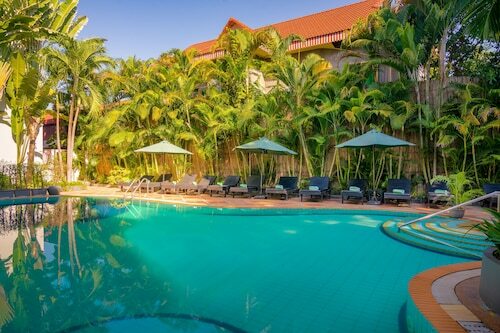 Siem Reap is home to 719 hotels and other accommodations, so you can find something that's perfect for your stay. André Boutique Villa: This 3-star hotel features a restaurant, free WiFi, and a computer station. 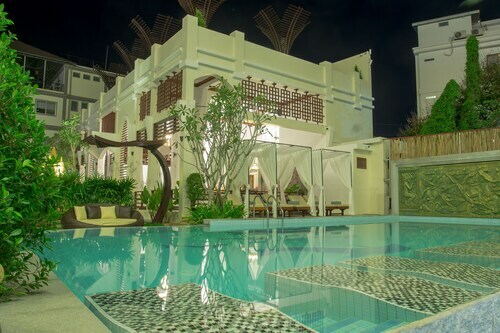 Saem Siemreap Hotel: With a stay at this 4-star hotel, guests can enjoy access to a full-service spa and free breakfast, along with free WiFi. It's a favorite with Expedia travelers for its family-friendly amenities and clean, comfortable rooms. Green Empire Resort: With a stay at this 3.5-star hotel, guests can enjoy access to free breakfast and a restaurant, along with free WiFi. Our customers like its overall value and quiet location. After you've visited Angkor Wat, you can explore the sights within a few miles of the area. You'll want to browse the collections at Preah Norodom Sihanouk-Angkor Museum, War Museum Cambodia, and Angkor National Museum. Phnom Bakheng, Angkor Bayon, and Killing Fields Memorial are landmarks that you won't want to miss. You might spend a leisurely day outdoors at Royal Garden and Angkor Archaeological Park. Pub Street and Cambodian Cultural Village are some sights worth a visit in the area. Spend some time checking out Angkor Night Market, which is 4.1 mi (6.5 km) from Angkor Wat, or make a stop by Ta Prohm Temple, located 2.2 mi (3.5 km) away.